Inventory We are a resale marketplace, not a box office or venue. Ticket prices may exceed face value. This site is not owned by Mercedes-Benz Superdome . The Mercedes-Benz Superdome, formerly the Louisiana Superdome often informally known as the Superdome, The Dome or the New Orleans Superdome is a sports and exhibition facility located in the Central Business District of New Orleans, Louisiana. Plans were drawn up in 1967 by the New Orleans modernist architectural firm of Curtis and Davis, the company also responsible for design of the main branch of the New Orleans Public Library. The Superdome is home to the NFL's New Orleans Saints and the NCAA's Division I Tulane University football team. 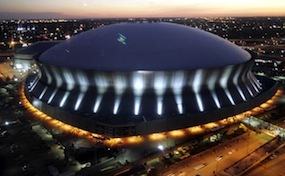 It is one of the few facilities in the United States which can host major sporting events such as the Super Bowl and the Final Four; as such, given New Orleans popularity as a tourist destination, whenever the Superdome bids to host such an event it routinely makes the "short list" of candidates being considered. It has been chosen to host Super Bowl XLVII in February 2013. MercedesBenzSuper.DomeNewOrleans.com is not affiliated with any primary box office or supplier. We are a privately owned and operated business specializing in sales in the secondary market. To buy tickets for any Louisiana Superdome events in New Orleans simply click on the event of interest or call our operators at anytime.